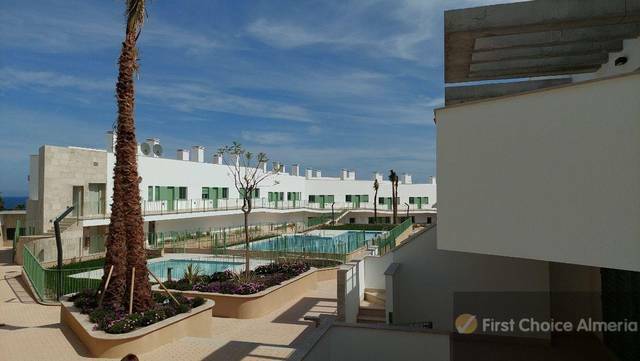 Perfect for full time living, this beautiful townhouse for sale is in the sought after residential area in Mojacar known as 'El Palmeral',situated on Calle Rapa,this area is very family friendly and in an area where most of Mojacar's professionals reside. Within walking distance to supermarkets, restaurants, cafes,and the medical clinic. This...linked 85.88 Townhouse sits on plot of 106.71m2 designated to the house and 56m2 for the terraces that sit to the front and rear of the home. It is 2 stories with 3 bedrooms, one being on the ground level, 2 bathrooms, air conditioning and pool. Appointments are welcome to view this lovely home.